I first saw the Sangre de Cristo Mountains many years before moving to Colorado. It was an idyllic Colorado day – bluebird skies, crisp air, and snow on the peaks with none in the valley. 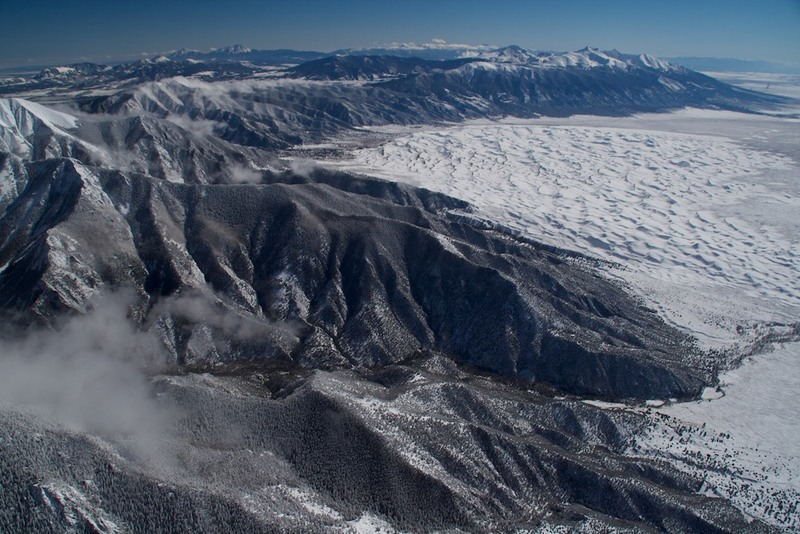 As I saw Great Sand Dunes for the first time, I figured that I understood exactly why the range got its name. Despite seeing these mountains numerous times, the aerial view elicited my own holy exclamations from the cockpit. While the range shares many characteristics with the rest of the mountains of Colorado, there is something completely different about them that I have had to work to identify. With peaks exceeding 14,000 feet, the mountains rise abruptly from a valley that is flat as a pancake and remarkably wide. Further, the peaks are nearly uniform, like the blades of a saw – making many other Colorado ranges look asymmetrical and disorganized. Within the sawtooth nature of the peaks, there are short valleys running perpendicular that look like fins. To top it all off, the valley is home to grasses and sagebrush with immediate pine forests at the mountain base and an accent of timberline. 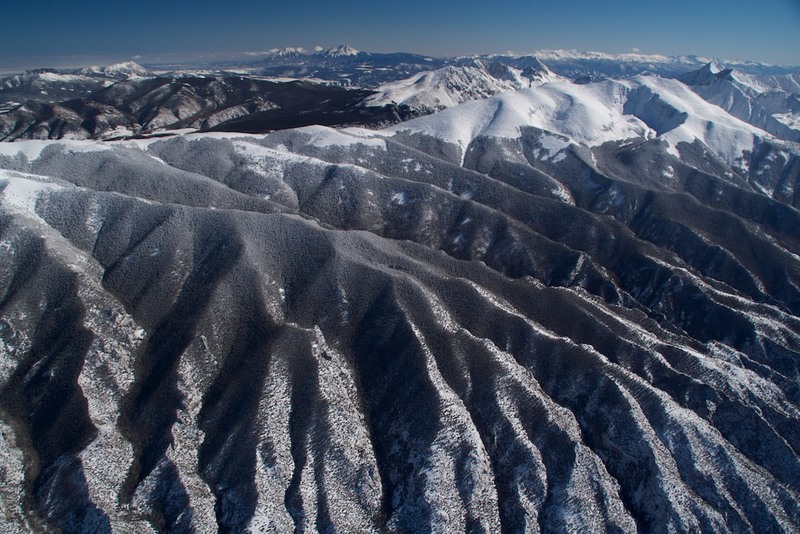 The Sangre de Cristo range is a work of finely chiseled natural composition. I decided to validate my imaginary assumption about the naming of the range. While it is not the story of privation and relief that I so whimsically dreamt up, it’s close enough. Antonio Valverde, a Spaniard who served in various government positions in New Mexico named the range in 1719. He was so moved by the red alpenglow of sunrise bathing the snowy peaks that he named them accordingly. While sunrises do happen all over the planet on a daily basis, this man was as awestruck 295 years ago as we are today seeing the same sight. He chose to name this beauty based on what was one of the most respected and revered symbols of his era. There are some experiences that take the beauty of living here to almost indescribable levels: standing on top of a Fourteener after a long climb or hiking in the snow on a full-moon night or, in my case, combining something of the two together. I find that words fail when trying to convey the majesty and poetry, if not spirituality, of such soul-stirring experiences. 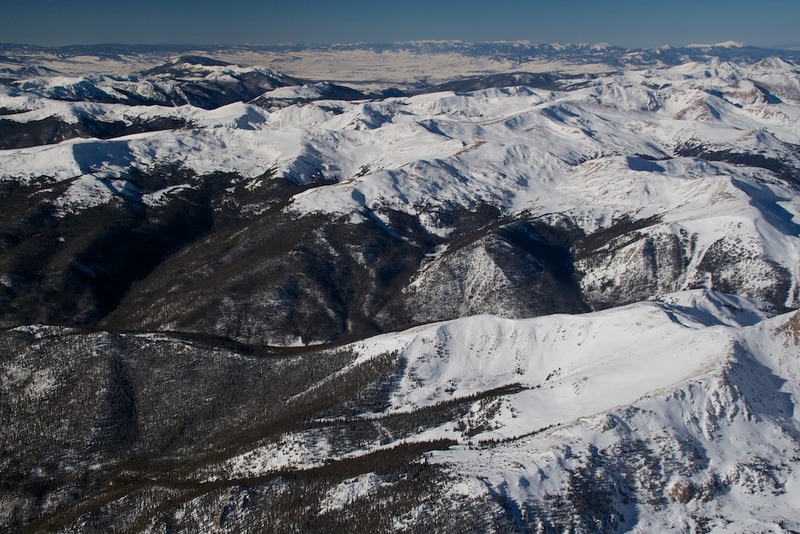 Getting into an airplane and flying over the highest parts of the Colorado Rockies is another one of those experiences. Having grown up next to my grandfather’s vintage aircraft restoration shop and private runway, I have been riding and flying regularly since age 2 and have flown my 1946 Piper Cub all over the country – “low and slow” – often with the door open, cruising 500 to 1,000 feet above the countryside. While the charm remains, flying can get a little boring if the terrain is flat and featureless. 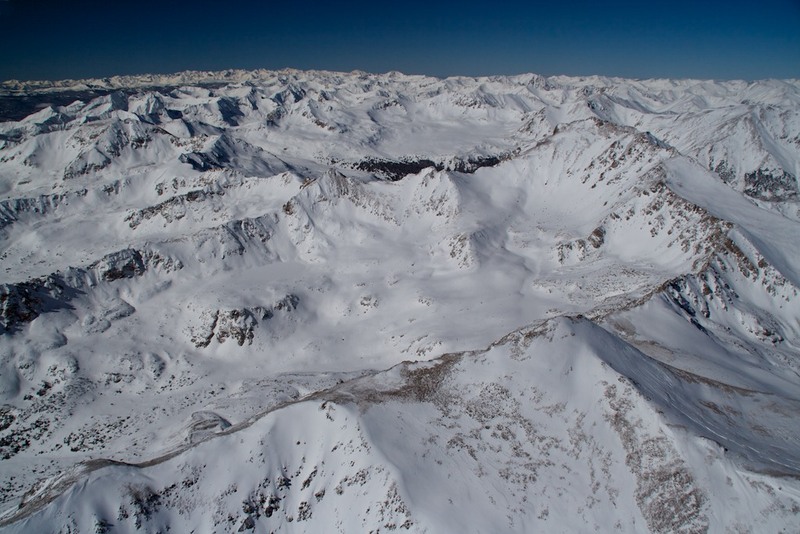 Flying over Summit County is like taking that first flight all over again – every single time I get into the airplane. This is the first installment in a regular column for the Summit Daily News in which I’ll be exploring the nooks and crannies of Colorado and sharing photos of what I find from the air. 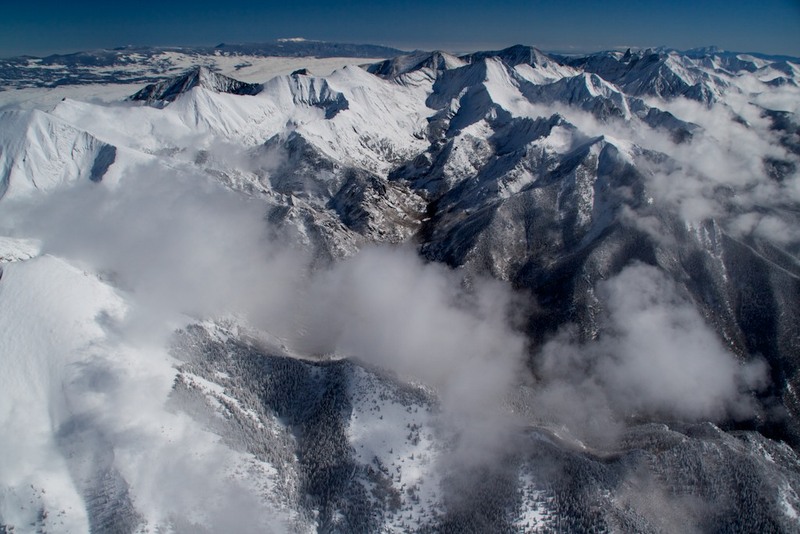 The aerial perspective has a way of enlightening our view of our surroundings – especially as terrain, public lands, roads and snow cover have ways of making it very difficult to relate to how things connect in Summit County. Winding roads, sketchy access and undulating terrain can be very confusing when hiking in the woods. It takes a number of hikes to a number of different vantage points to start putting it all together. Five minutes in an airplane and things start to make sense. The focus will be the Summit region – with occasional forays over other areas of the state. The goal is to share the experience of being “above the Summit”: the beauty, know-how and some fresh perspective on events and the passing of seasons. Based at the highest airport in North America — Leadville — there will be plenty to share on the intense challenge of safe flying here, along with the intriguing charm of doing it all in a 68 year-old airplane. Garrett Fisher lives in Breckenridge and is the author of “The Human Theory of Everything” and soon-to-be-published “Extreme Autumn: Fall in Colorado.” He runs the Institute for Economic Innovation and FinanceSolutions LLC. 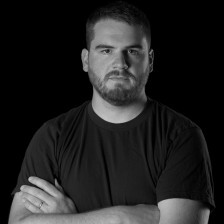 Contact him at www.garrettfisher.me. 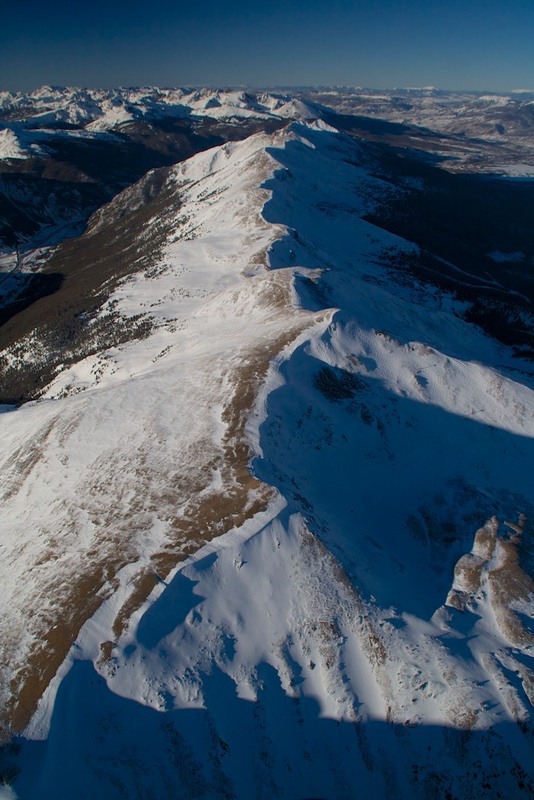 An aerial photo I took recently of the Collegiate Peaks was featured today in the Summit Daily in an article on above-average snowpack. The photo itself is of probably the most contiguous west-east orienting mountains in this part of the state. Stretching from well west of Aspen to Twin Lakes (south of Leadville), there is nothing but an endless sea of mountains. From a pilot’s perspective, they look like teeth ready to chew up and swallow unsuspecting airplanes that dare venture in there. For the worriers, I must note that behind me in the photo is a spacious and flat valley. In the event of engine failure (the one thing I can’t seem to forget about around here), I can easily glide to a flat field and land. Were I to venture into this lovely wilderness and same said paranoia of engine failure materialized, well, it would be a powdery, cold, and long outcome before it resolved itself. 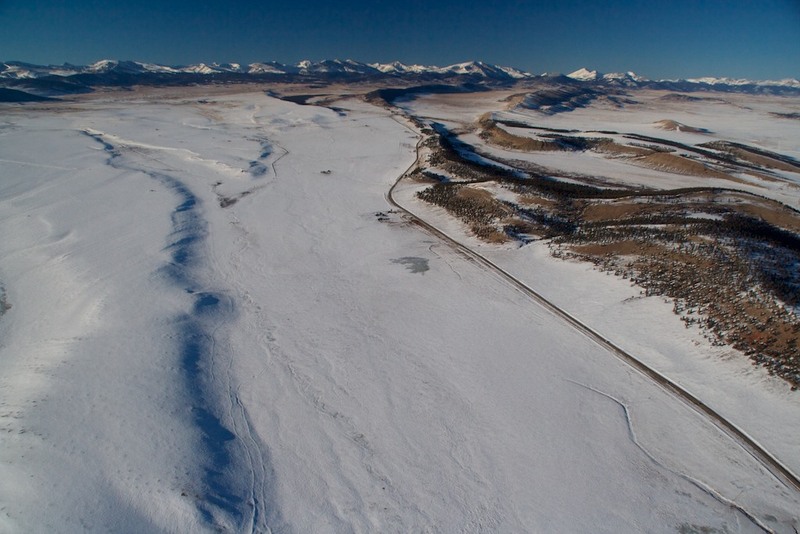 The article is here http://www.summitdaily.com/news/10079591-113/snowpack-snow-percent-colorado and the photo below.